Grasse, Musée Fragonard from 5 April to 31 December 2012. 12/6/12 - Exhibition - Grasse, Musée Fragonard - The Musée Fragonard in Grasse, inaugurated last year (see article, in French), is offering, at the same time as the permanent presentation of works by Fragonard, Marguerite Gérard and Jean-Baptiste Mallet, a small temporary exhibition on the theme of "figures of men", made up of about twenty paintings and drawings taken from the Hélène and Jean-François Costa collection. This is not a portrait exhibition in the strict sense of the term as certain likenesses are "fantasy figures" or expression heads, but rather a gallery of faces, ranging from the 15th to the 19th century with, obviously, a preference for the 18th, especially dear to these two collectors. 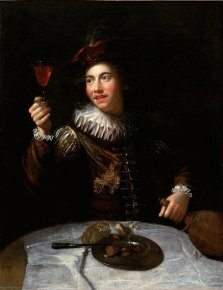 Of special note is Alexis Grimou’s The Drinker (ill. 1), with his ruddy complexion and jovial air, enhanced by the chiaroscuro shading, dark background and white collar ruff. 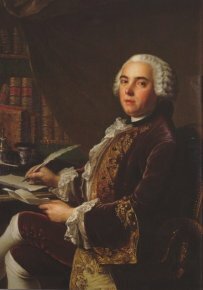 The costume and accessories would tend to place the work as a genre scene, but the personalized features of the face make it a portrait (perhaps even a self-portrait as suggested by a painting residing at the Louvre), although it would seem to evoke a character, that of the "bon vivant", instead of an actual person. It provides an interesting contrast with another figure at a table, but in this case a desk : the very serious Pierre-Jacques Onésyme Bergeret de Grancourt is represented by Louis Tocqué (ill. 2), a student and son-in-law of Nattier, who wrote a text on portraiture. The artist took care in representing the details of the wealthy costume and the bound books to underscore the status and culture of the model, who was to become a high-ranking finance official in the regional administration of Montauban. Vincent would represent him in a more monumental, freer illustration as well. Further on, we find another eloquent comparison on the diversity of this genre : that of A Toulouse Urchin, attributed to Pierre Subleyras (ill. 3), along with Prince Lubomirski as Amphion by Elisabeth Vigée-Lebrun (ill. 4). The first, swiftly executed, was probably painted before the artist’s departure for Rome in 1728 and also represents a character. The second seems to have been a replica dating from 1817 of a 1792 composition lost today. 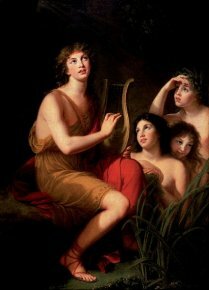 Vigée-Lebrun had already resorted to mythology in order to represent the prince ; here she surrounds him with the Mesdemoiselles de Guiche and de Polignac, alongside Brunette, the artist’s daughter, disguised as nymphs. The exhibition is not very big, contained in one room, but it offers the public a unique chance to view a private collection. The selection of these diverse masculine figures is also an opportunity to pay tribute to Jean-François Costa, a man of many talents and an astute collector who passed away last February. The exhibition runs from 5 April to 31 December 2012. Andrea Zanella, Figures d’hommes. 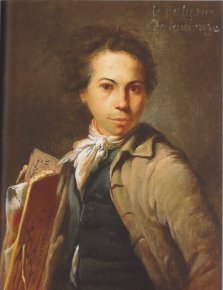 Portraits du XVe au XIXe siècle, Musée Fragonard, 2012, 62 p. ISBN : 978-2-9538462-1-8. Visitor information : Musée Fragonard, Hôtel de Villeneuve, 14 rue Jean Ossola, 06130 Grasse. Tel : +33(0)4 93 36 02 07. Open every day from September to June from 10 am to 6 pm ; July and August from 10 am to 7 pm.